Belgium is a country, where stadium infrastructure was underinvested for years. Now there's a major wave of new developments sweeping the country, largely private and economically sensible, within the constraints of each club. But perhaps the most interesting element of the economic constraints is how timing of structural intervention is limited almost entirely to the summer period. 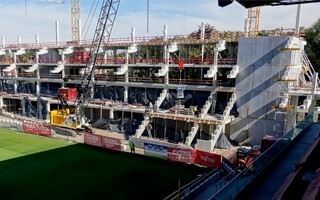 In order to not lose capacity during the active period, entire grandstands are being built with a schedule of just 3-4 months! We've seen it happen in Leuven, Antwerp, Oostende and now in Mechelen as well. 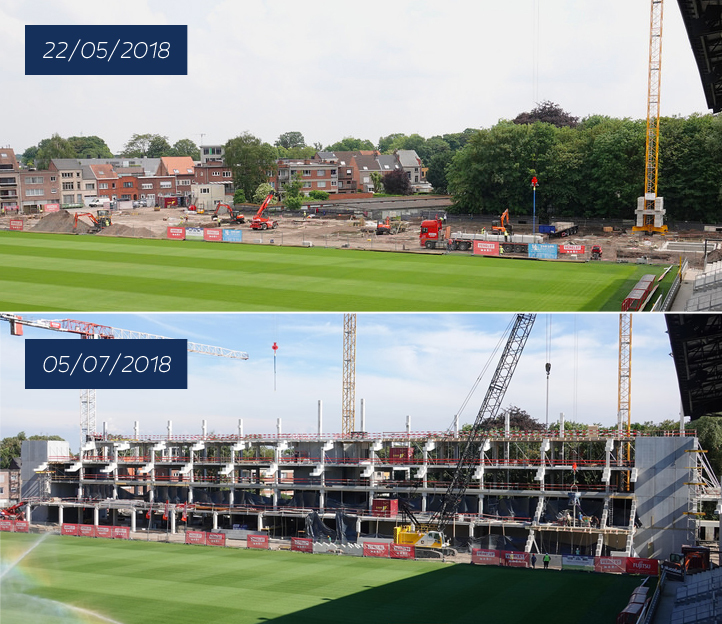 Here the demolition of old main stand was launched in mid-April and by first days of May foundation works followed. We should add at this point that the new grandstand is a couple times bigger in terms of floor space, covering 4 levels with some 3,000 seats, including 36 private boxes. Of these boxes, interestingly, only 6 are still available, all remaining ones are booked by customers. Today, after just two months of construction, flags were raised on top of the stadium. The symbolic topping out ceremony celebrates reaching the highest point of the concrete structure. At the height of 19.44 meters the stand has all 4 levels in place, which was celebrated with traditional Belgian fries by workers. Celebration aside, there's still a lot to do in Mechelen. 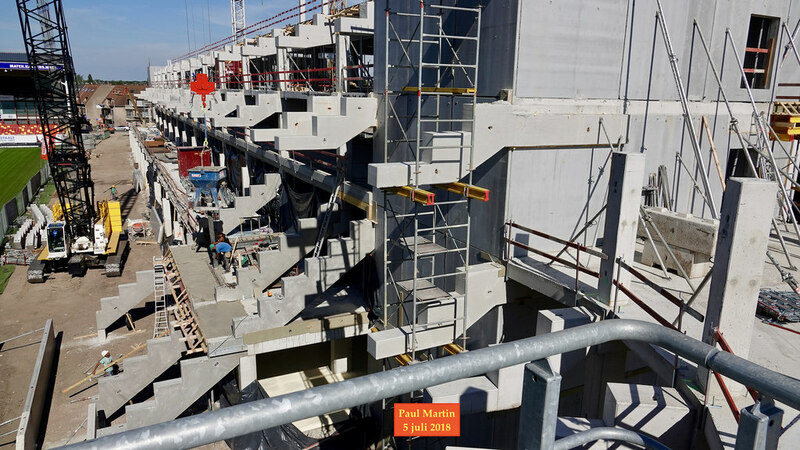 The precast auditorium needs to be laid, all of the steel roof structure awaits mounting on top and then masonry, installations and furnishings must follow. All of which has to be at least operable, if not entirely ready, by mid-August. And today KV Mechelen assured the project is on track for timely delivery.